We have made it to the end!! It is final layout day!!! Way to go :) Unfortunately, I am not quite as far as many of you and therefor today's tutorial will be with digital pictures instead of camera pictures. I am sorry if this causes any issues for any of you. I tried, but just couldn't get my stars all done and after 2 hours of straight contractions yesterday night (which eventually died off, grrr) I decided I better get this post up asap. 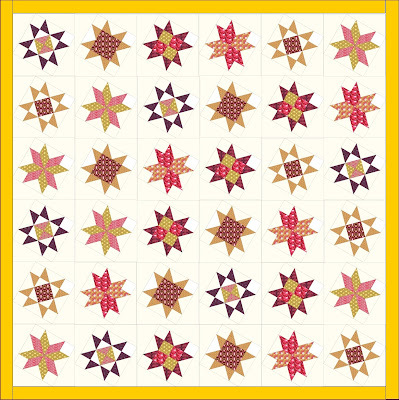 Star by laying your quilt blocks out in your desired arrangement. 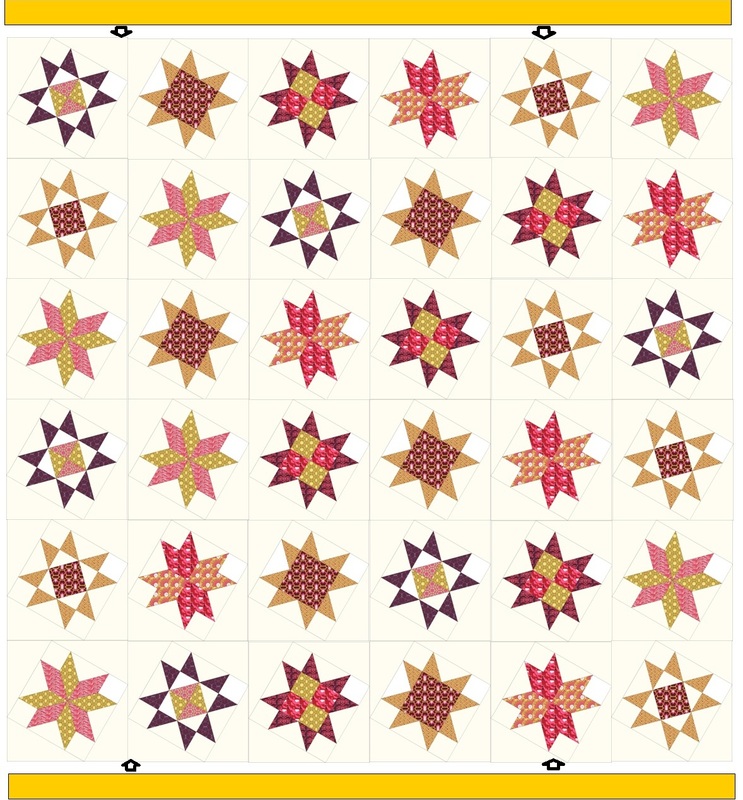 For the Queen size you will be doing a 6 x 6 layout. (If you are doing a different size just arrange them in rows as you desire). Go ahead and play around with your blocks until you get them in an arrangement that is pleasing to the eye. 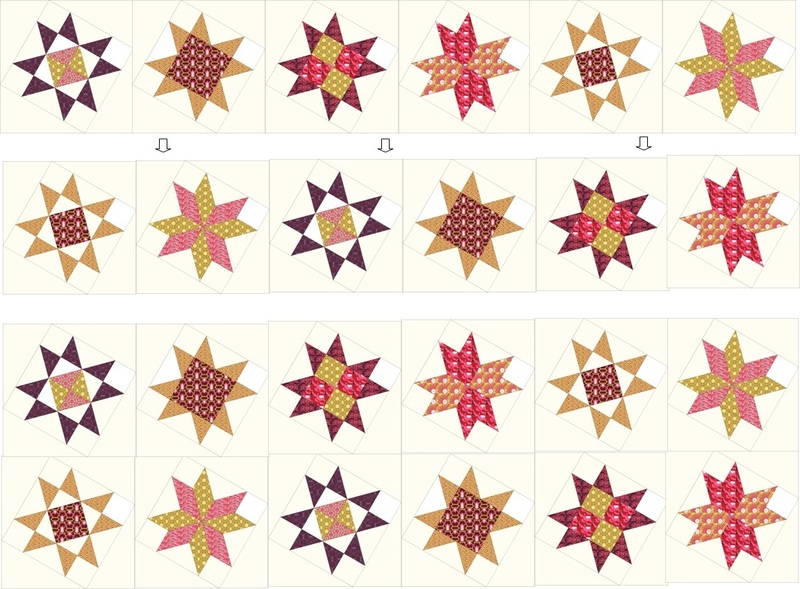 Once you like your arrangement you can sew your blocks into rows. This is simple. Just take the first block in the first row and lay it onto the second block in the second row with right sides together and pin. Then sew a 1/4" seam along the pinned edge and press. 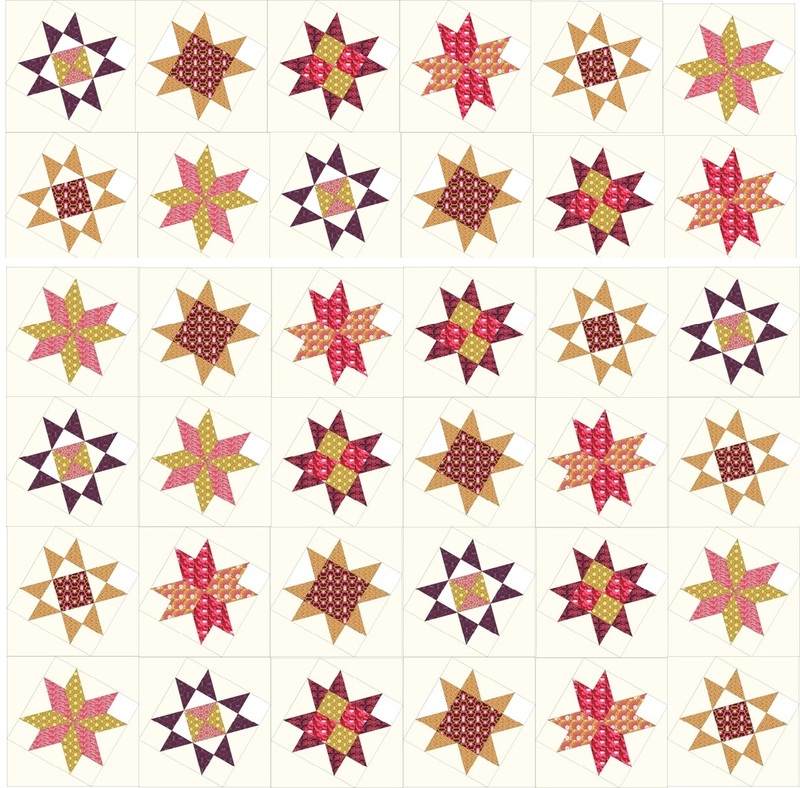 Keep adding blocks to the rows in this fashion until you have all 6 (or however many you are doing) sewn together. Repeat this process for all of your rows. 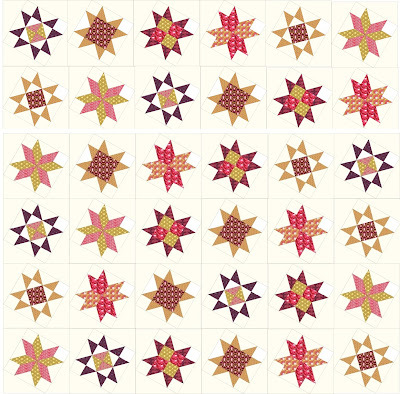 And now that your rows are sewn together you can sew your rows into your quilt top. This is the same process just on a larger scale. Start by placing Row 1 onto Row 2 with right sides together. Pin along the seam edge making sure to match up your seams at the corners of your blocks. Sew 1/4" seam along the pinned edge and press. Repeat this process adding one row at a time until you have sewn all of your rows together. 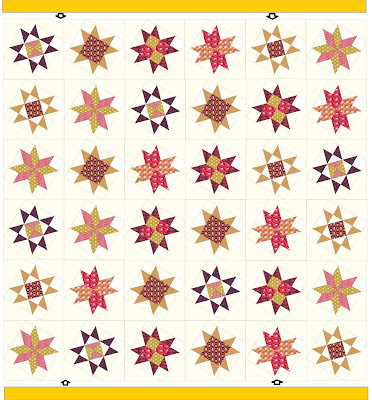 Your Quilt top should now look just like your original layout but now it is all sewn together :) Isn't it exciting!!! Start with your 1/3 yard Inner Border fabric. Cut it into 8 strips measuring 1 1/2" each. This will use the entire 1/3 of the yard so cut carefully. Now we want to turn those 8 strips into 4 strips so go ahead and lay 2 strips with right sides together and sew 1/4" seam along the 1 1/2" edge. Press. Repeat with the other strips to make a total of 4 strips measuring 1 1/2" x 86"ish. Now onto your 1 1/4" yard Outer Border fabric. Cut it into 8 strips measuring 5 1/2" each. Once again, cut carefully. And once again, we will be turning those 8 strips into 4 strips so lay 2 strips right sides together and sew 1/4" seam along the 5 1/2" edge. Press. Repeat with the other strips to make a total of 4 strips measuring 5 1/2" x 86"ish. Adding borders is fun and fast. We will start by attaching the top and the bottom border first. Lay the top small 1 1/2" border along the top of the quilt with right sides together. There will be excess hanging off but no worries. I normally just align my borders as I sew and don't use pins but if you are more comfortable pinning you are welcome to. Sew 1/4" seam along the edge and press. Trim away the excess border fabric. Repeat the same process for the border along the bottom of the quilt. And now adding the sides is the exact same process. Just align your side as you go sewing 1/4" seam along the edge. Press your seam, trim the excess fabric and Whala!! The first border is added. Your top should look something like this. Now adding the second border is the exact same process as the smaller border. Add your top and bottom border first. 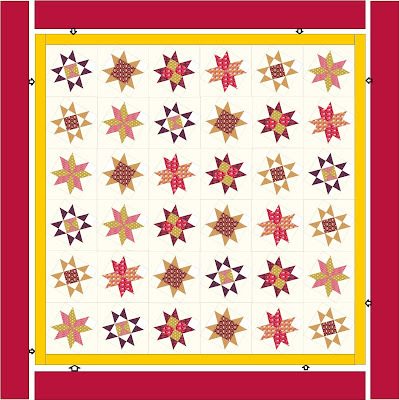 (If you are doing a square you will want to make sure you are doing the same top and border first and that you haven't flipped the quilt :) Then add the side borders second. I can't wait to see everyone's finished tops!!! Be sure to post your finished top in our Flickr Group :) It has been so much fun seeing everyone's progress!!! Okay, this is where it all ends :( I am actually sad to see this coming to a close. It has been so much fun. I have just loved watching your stars come together and to see the amazing variety!! Thank you to everyone that has participated along with me!!! You are what makes doing things like this so worth the time. Thank you, Thank you, Thank you!!! Since this is a rather large project I assume most will be sending their tops off to be quilted. Or some of you might be brave and quilt it on your own but I understand that will take some time. 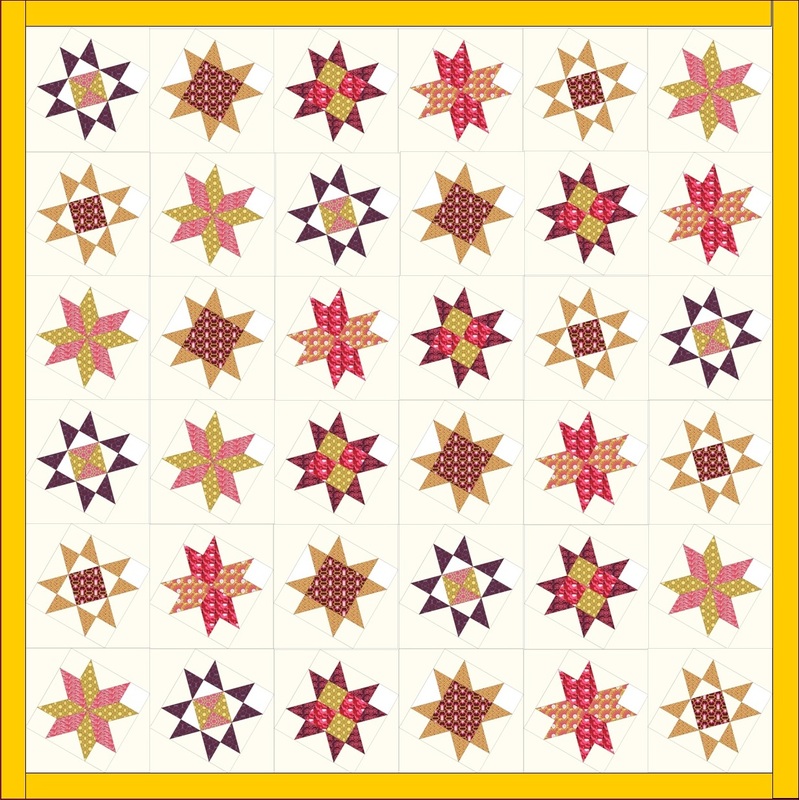 So because of those factors, you are not required to have your quilt completely finished in order to enter into the Fat Quarter Gift Certificate drawing. Just have your top done. So once you have finished your top . . .please either add a finished picture to our Flickr Group or email me a finished picture. This will enter you into the Fat Quarter Shop Gift Certificate Drawing. And since I am such a horrible example of procrastination I will give you some time to get your tops all done. The deadline for the pictures will be the 29th of September and on the 30th I will do a Parade of Quilts on my Blog and announce the winners. What a great way to end the month!!! With all the above said about not having to finish your quilt I wanted to take the time to mention the following . . . Please don't let this fall into a lonely WIP pile. You have put so much work into it. And your blocks are all so amazing. Please finish this up. I promise to get mine done soon as well. And please, please, feel free to add your completed project to the flickr group. I just love to see things all quilted and bound. So beautiful!!! THANK YOU ALL FOR QUILTING ALONG WITH ME!!! I AM ALREADY LOOKING FORWARD TO THE NEXT ONE!!! 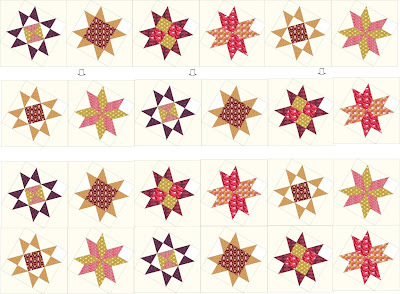 Thank you so much Melissa for the wonderful tutorial for the Star Quilt-A-Long. 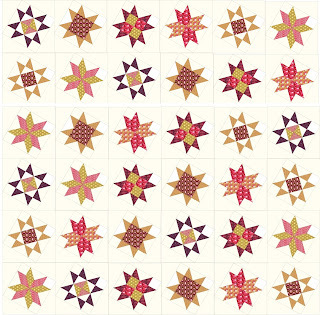 I will be busily stitching to to reach the deadline.Have enjoyed participating in my first Quilt-A-Long. Wishing you all the best with your special event. Melissa, this was a perfect tutorial and the blocks are beautiful..thank you so much! Melissa, thank YOU so much for taking the time for this QAL, once again it's wonderful and I'm hoping to be all caught up by the deadline! Hope all goes well with you :) You know we'll be pleased with some news when you have time to share - blessings! yay! thanks for the extended deadline - i've also fallen behind! heh heh. i wasn't planning to do boarders - not a border type of gal - so would having my blocks all sewn together count as a finished top?